Get organized. Start a "move file" to keep track of estimates, receipts and other information. You may be able to deduct your move and lower your taxes, so check with the IRS to see what expenses can be deducted on your next tax return. Research your new community. The local Chamber of Commerce is a great place to find information about your new home. Stay Healthy. Gather medical and dental records - including prescriptions and shot records. Ask your existing doctors if they can refer you to care providers in your new city. Prepare your children. Arrange to have school records transferred to your children's new school district and/or daycare. Involve your children in the moving process, from picking out the new home to packing their toys. Relocating can be a "scary" adventure, so make sure you talk to your family about the move. Visit about the new community and discuss how to make new friends. Budget for moving expenses. Depending on how far away you are moving, you may want to look at relocation months ahead of time to prepare. Moving services can be costly, and with the purchase of a new home, it's best to be prepared. When you reserve your moving services, make sure to get a quote so you know how much to budget. Contact utility companies to disconnect, transfer or connect services. Plan on keeping current services through your move date and having new ones available prior to your move-in date. Return library books and pick up dry cleaning or items out for repair. Call your local newspaper and set a date to cancel your subscription. Call your insurance agent to see what changes to expect in your policies. 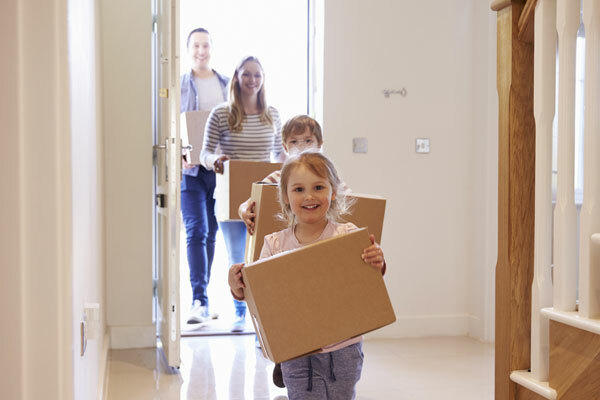 Ask if moving is covered and arrange for insurance for your new home. Contact health clubs or other organizations to which you belong. Ask how you can end, sell or transfer your membership. Contact your bank and/or credit union to transfer or close accounts. Clear out safety deposit boxes. Pick up traveler's checks or cash for "on the road" expenses. Keep in touch. File a change of address. If you don't know what your new address will be, ask the postal service to hold your mail in their office in your new city. Make a list of friends, relatives and businesses that will need to know of your move and send your new address to them as soon as possible. Postal forwarding time is limited. Decide what items need to go before your move and plan a yard sale or contact your local charities. If you donate, be sure to get a receipt for income tax purposes. Make a list of things that are valuable or difficult to replace. Ship these items by certified mail or carry them with you. Start collecting boxes and other packing supplies at least a month before your move. Use up things that can't be moved, such as frozen foods, bleach and aerosol cleaners. Drain all gas and oil from your mower and other motors. Gas grills, kerosene heaters, etc. must be emptied as well. Empty, defrost and clean your refrigerator at least 24 hours before moving day. Reserve your moving truck. Do this at least a few weeks before your move. If you need a ramp or other loading equipment, make reservations with a local equipment-rental yard. Phone books, pencils and paper, your "move file"
Finish up. Before leaving your old home, check every room, closet and cabinet one last time. Make sure everything is loaded. Leave a note with your new address in the house so future occupants can forward any stray mail. Get connected. Check to see if your mail is making it to your new address or pick up any mail being held. Fill out the paperwork. Get a new driver's license and new tags for your automobile. And don't forget to register to vote. In many states, you can do this when you get your new license. Stay up to date. Contact the local paper for a new subscription.